OMG, the Roomba 960 is now $84 less on Amazon than iRobot’s official Black Friday sale! When iRobot announced its Black Friday 2018 sale and said that the $700 Roomba 960 would be on sale for $500 for Black Friday 2018, people were beyond excited. The 960 is a flagship robot vacuum that includes Wi-Fi connectivity and even Alexa compatibility. It also has the strongest suction and best overall performance of any Roomba we’ve ever tested. 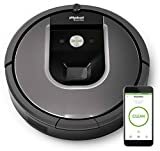 Well if you thought a $200 discount was a big deal, there’s something you need to know: Amazon has the iRobot Roomba 960 Robot Vacuum with Wi-Fi Connectivity and Alexa for $84 less than iRobot’s official Black Friday sale — just $415.99! This sale will almost certainly sell out, so grab one as soon as you can.